There are a number of Remembrance Day services and events happening in the Town of Halton Hills this weekend. Residents are invited to pay tribute to the past and present members of the Canadian Armed Forces by joining us at the once in a lifetime, special Bells of Peace Service that takes place at sunset on November 11th. Members of the community are welcome to meet at the Georgetown Cenotaph by 4:30 pm. November 11, 2018 will mark the monumental gathering in France and Belgium on the occasion of the 100th Anniversary of the end of the Great War, the final events which will bring to a close four years of Remembrance and reflection – a centenary that will also no doubt include various events and ceremonies that will take place across Canada. The Royal Canadian Legion will assist in commemorating this historical 100th centenary, through the introduction of a Bells of Peace Initiative to honour through Remembrance, the Armistice of 1918. The general concept derives from the use of bells as a celebratory announcement that the war had ended. This was common at the end of both WW1 and WW11. The Legion’s intent is to have every bell in every community across Canada ring in unison or independently (within each community) 100 times at sunset on November 11th, 2018 to signify the 100th anniversary of the WW1 Armistice. The Halton Hills Concert Band (HHCB) is excited to present the 6th Annual, “With Glowing Hearts Musical Tribute” to the Armed Forces on Saturday, November 3 at 7:30 pm. This year’s guest performers include the Lorne Scots Pipes and Drums and the Georgetown District High School Symphonic Band. Enjoy a variety of music, including popular Movie music, Marches, Sing-along and classic Swing tunes, performed against the backdrop of powerful visuals designed to remember and celebrate the Armed Forces. Come out and enjoy the original show that brings the pomp of the military tattoo to a concert setting with a Colour Guard of the Royal Canadian Sea Cadets Chaudière, 676 Royal Canadian Army Cadets and the 756 Royal Canadian Air Cadets. A portion of the proceeds will be donated to War Amps Canada (local). For more information on the Halton Hills Concert Band, please visit www.facebook.com/haltonhillscb. The Georgetown Lions Club Parade started in 1932 and has been a continuous event since that time. The parade is now an evening event starting at 5:00pm and ending approximately 7:00pm. The over 80 entrants feature floats with many lights, making it truly a memorable evening. 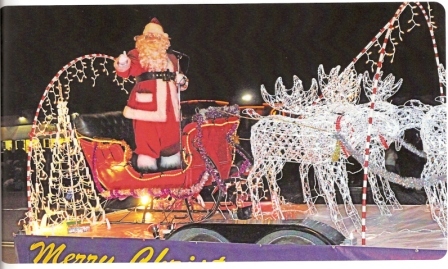 Of course the main feature is the arrival of Santa Claus who rides in the Lions Club Sleigh. While the Town of Halton Hills provides assistance with the event, the Lions are fully responsible for the oganization and costs of operating the parade. 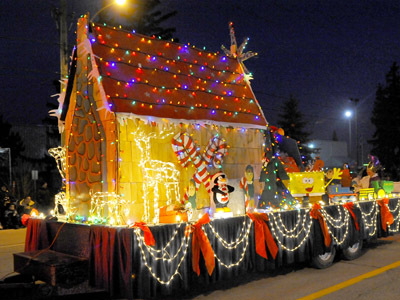 The parade starts at Sinclair Ave. and Guelph St. in Georgetown and goes west along Guelph turning left on Mill St. to Charles St., finishing at the Georgetown Fairgrounds Park. The parade assembles on Sinclair Ave, and Todd Rd. Registrants are encouraged to arrive via Todd Rd. at Mountainview Rd. N.
PLEASE NOTE PRE-REGISTRATION IS REQUIRED AS ALL THE SPOTS ARE PRE ASSIGNED. Once your float has been registered you will be emailed further information and assigned a number. The numbers are displayed on stakes along the side of the road. It is importanct that you park in your assigned space. Click on the link to view the map. Click here to obtain your regisration form. Like all community events the Lions Club relies on civic minded businesses for their support, In 2017 we introduced a new category of sponsorship called Community Champions and with their support the Club was able to operate the event. As part of their sponsorship the company names were placed on the Lions Events Trailer. The classic story tells of Belle, a young woman in a provincial town, and the Beast, who is really a young prince trapped under the spell of an enchantress. If the Beast can learn to love and be loved, the curse will be lifted. But time is running out. If the Beast does not learn his lesson soon, he and his household will be doomed for all eternity.